Jenna and Travis had a great day out on the water. Great day on the water. 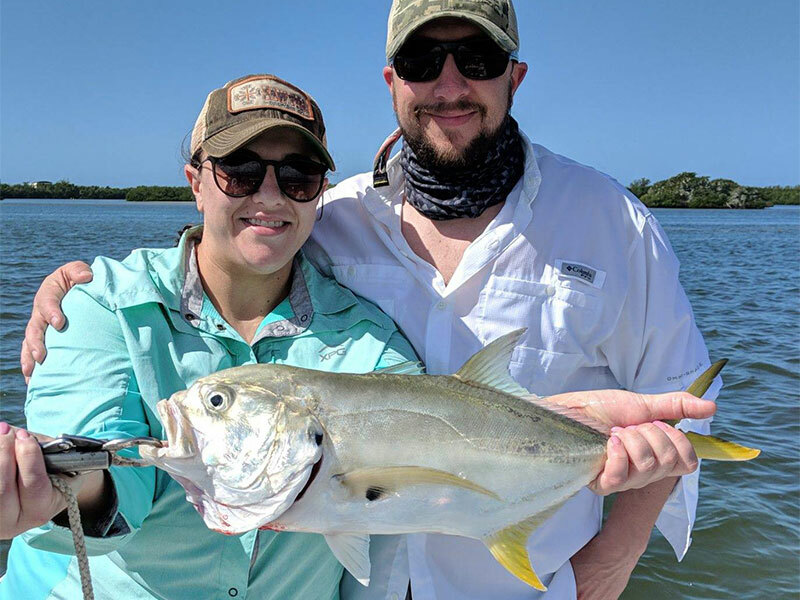 Jenna and Travis flew into Sarasota to attend a wedding at old Spanish Point this weekend and decided to take a couple extra days beforehand to do some fishing and relaxing on the beach. 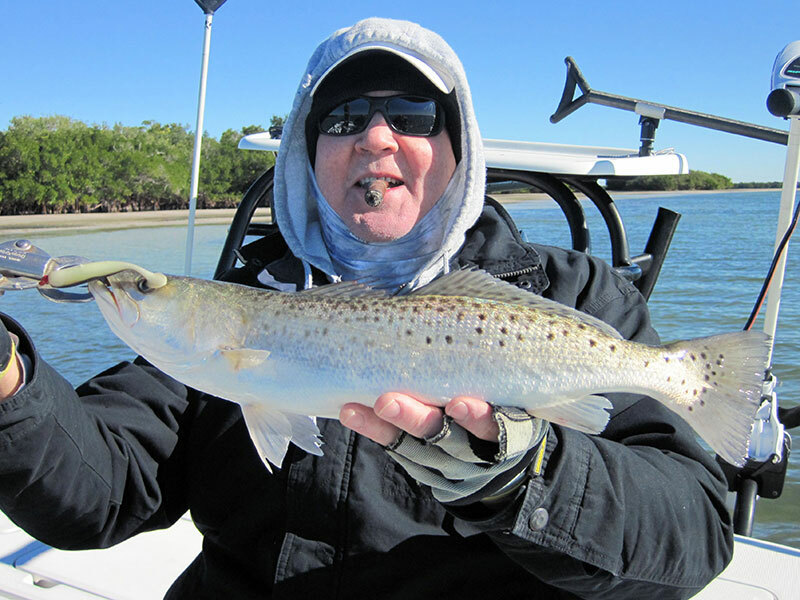 For the first time in quite in a while, we found Game fish cruising the skinny flats in Sarasota Bay. 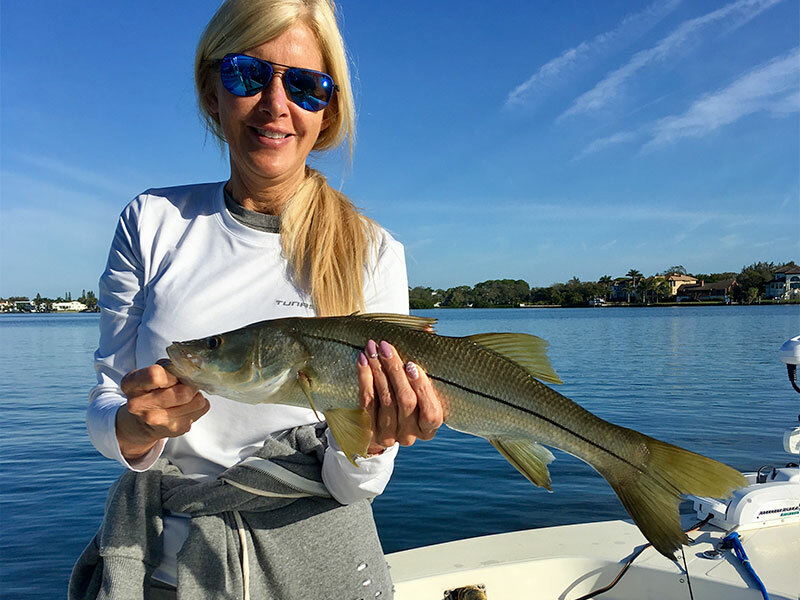 The couple were experienced fly fisherman from the Colorado area and were able to catch redfish, snook, large jacks and ladyfish using artificial bait on spin casting outfits. 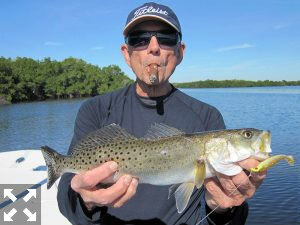 The warm temperatures and spring-like weather are a real boost to the local fishing. So what are you waiting for… make some time and throw out a line or two! 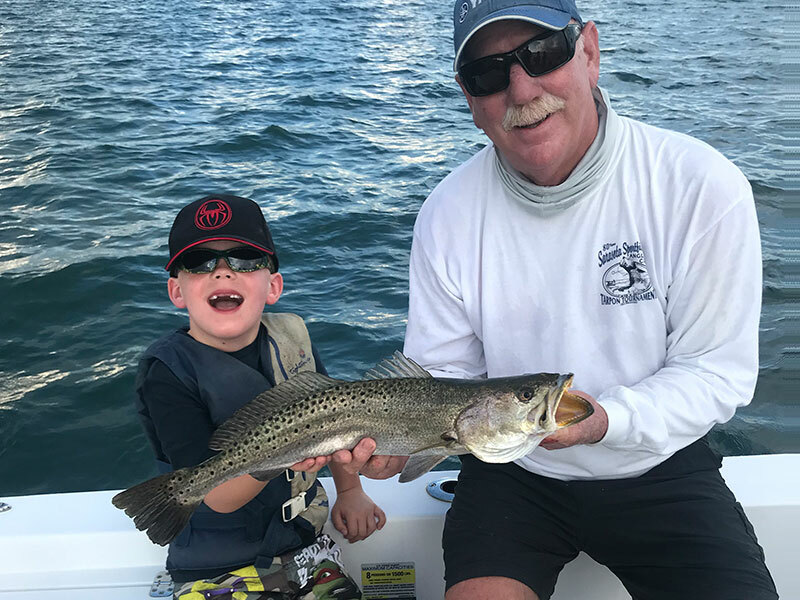 Both Father and Son have a great day out on the water. Fishing has slowed down over the past few days but still it's been pretty decent overall. The water temperatures have been slowly rising and the bite should get going again strong by tomorrow or the next day at the latest. 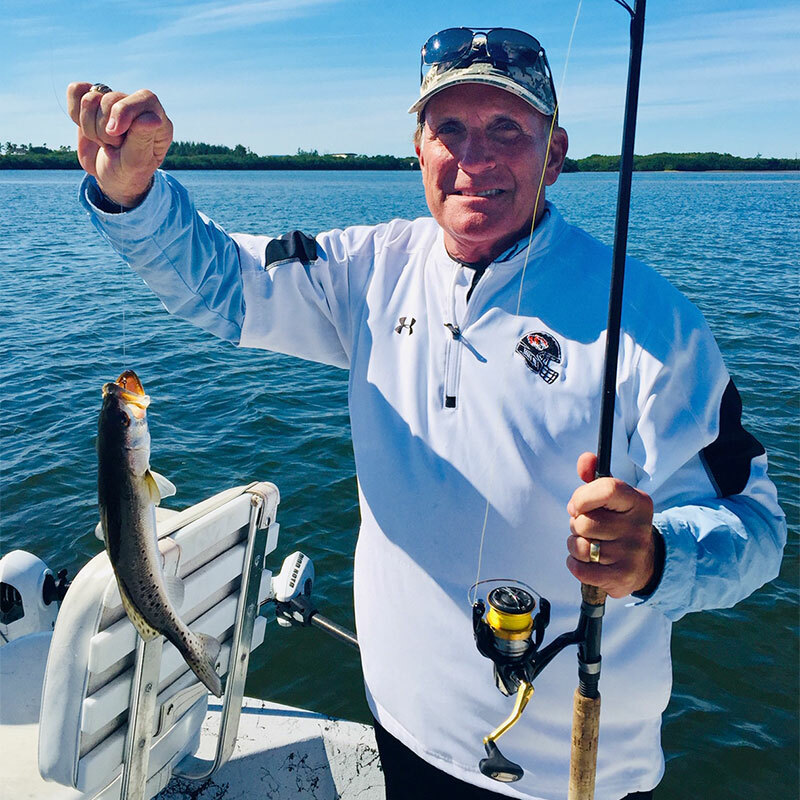 I had a wonderful father and son fishing excursion yesterday. 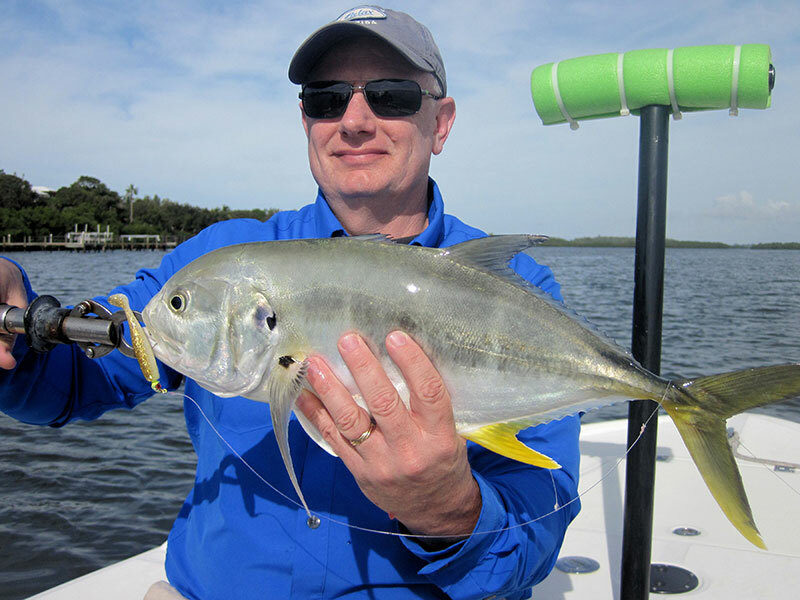 The son caught a huge pompano and was the top rod on the boat for the day. I look forward to taking them shark fishing, possibly in the spring, I think they'd really like that. Water tempatures are rising on the southern gulf coast. 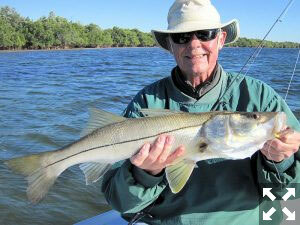 With the water temps rising to around 70 degrees fishing has started to improve in our area. Anglers fishing with me out of CB's have had some decent action fishing with live bait. 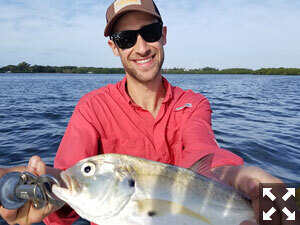 Sheepshead, snapper, have provided most of the action as well as some large jacks. 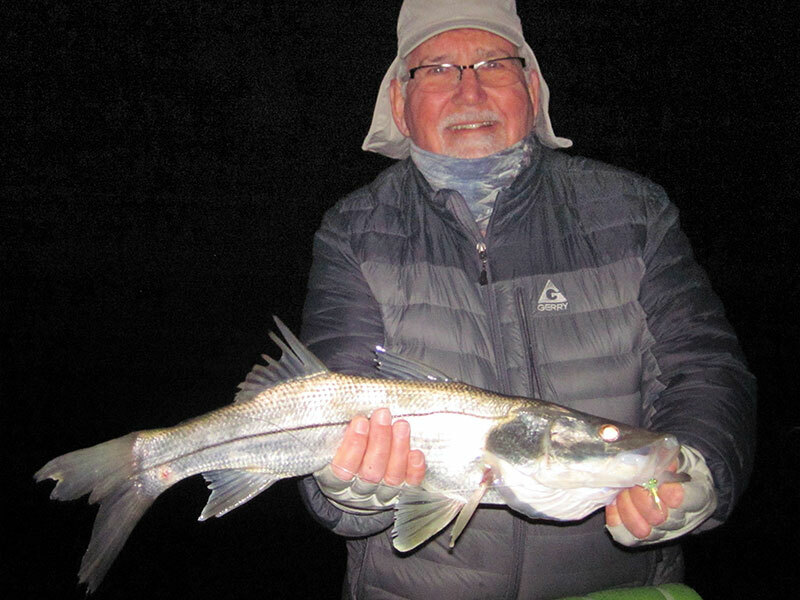 We also caught and released a few snook as well. Hopefully this year we will not see a repeat of last years red tide and our fisheries will be able to recover. 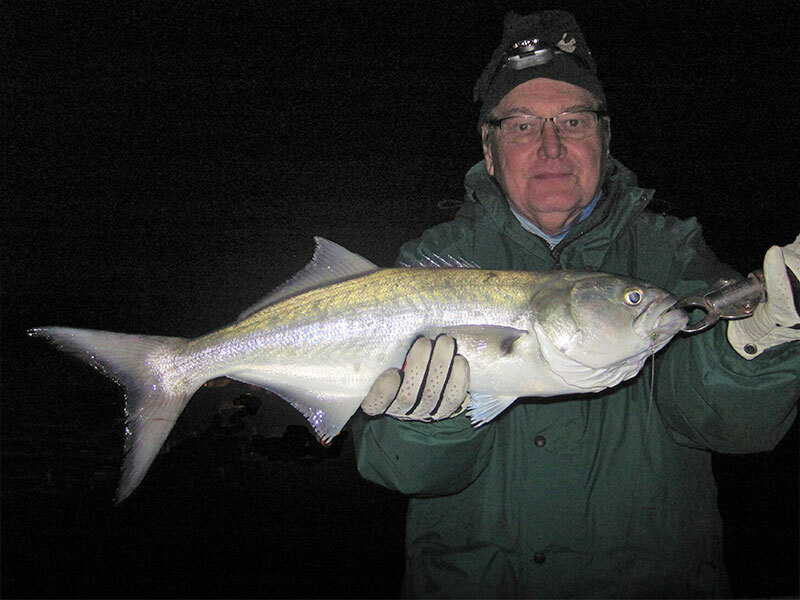 I’d really like to stress the importance of releasing most of our gamefish as they are the future of fishing in our area. We've had some good fishing over the past few weeks. Anglers fishing with me aboard the Casual Lies out of CB’s Saltwater Outfitters had some good fishing over the past few weeks as the weather has been nothing short of spectacular. 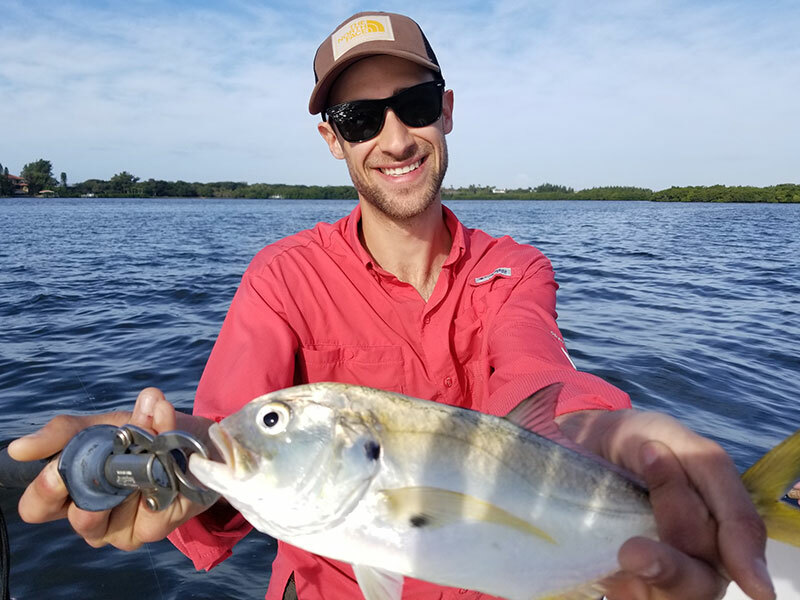 Throwing CAL jigs in Little Sarasota Bay my anglers caught Mackerel, Jacks, Ladyfish, Trout and some Pompano that have been showing up more and more lately. Fishing docks with live shrimp worked out well with a few Sheephead and Mangrove Snappers that we were able to catch. 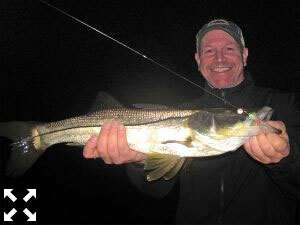 Angler's aboard the Tide Tuit had some great action over the last week. 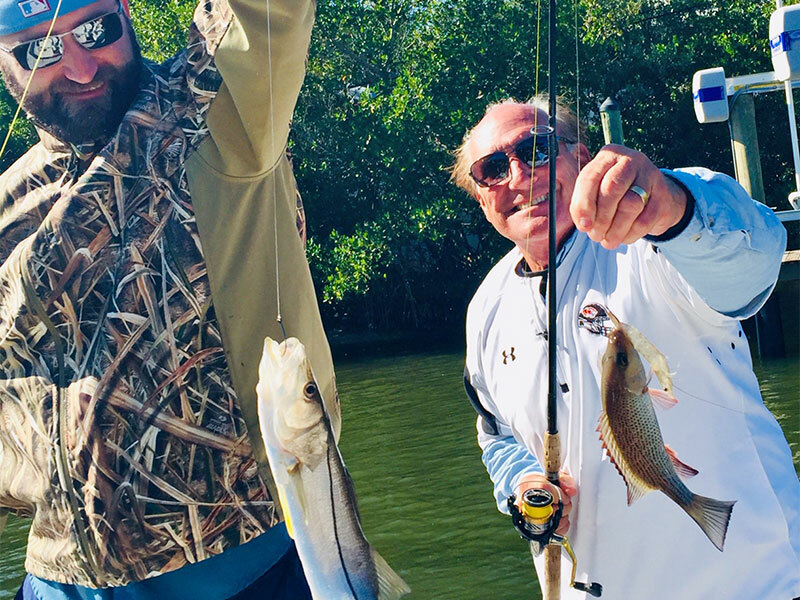 The hottest action was provided by sheepshead, and mangrove snapper around docks on Siesta Key. 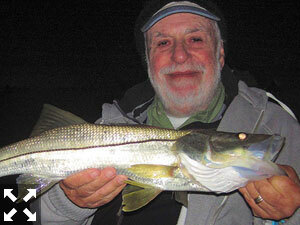 The night snook fishing has also been good. 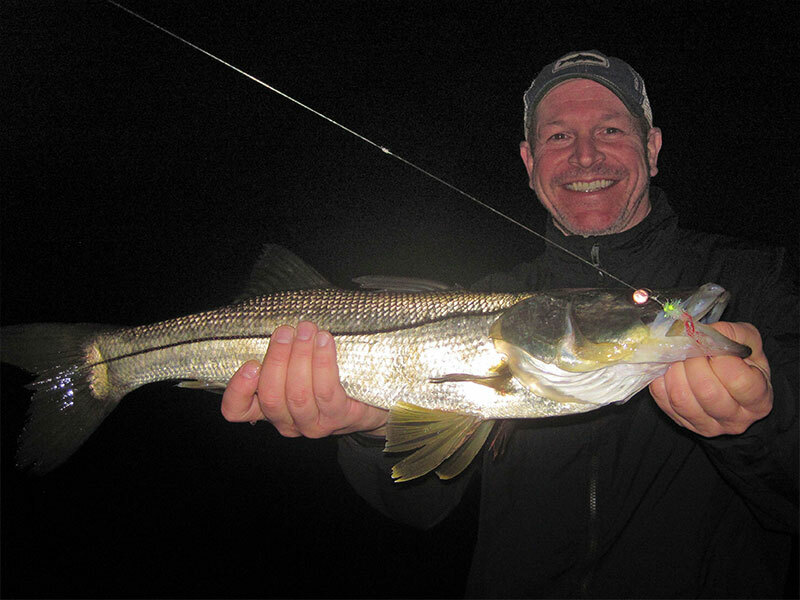 Anthony, Chris, and McKenzie Cole had a fun night, catching 20 or more snook as well as some big jack crevalle on shrimp and flies. Lot's of Dolphins in the intercoastal this time of year. We’ve had some very cold mornings that have affected the fishing and slowed it down until the sun gets out and the warmer water prevails. About 8:30 the bite begins to turn on and from there on out it’s a great day. 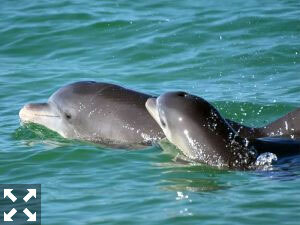 There are lots of Dolphins in the intercoastal this time of year because of the cold water in the gulf. 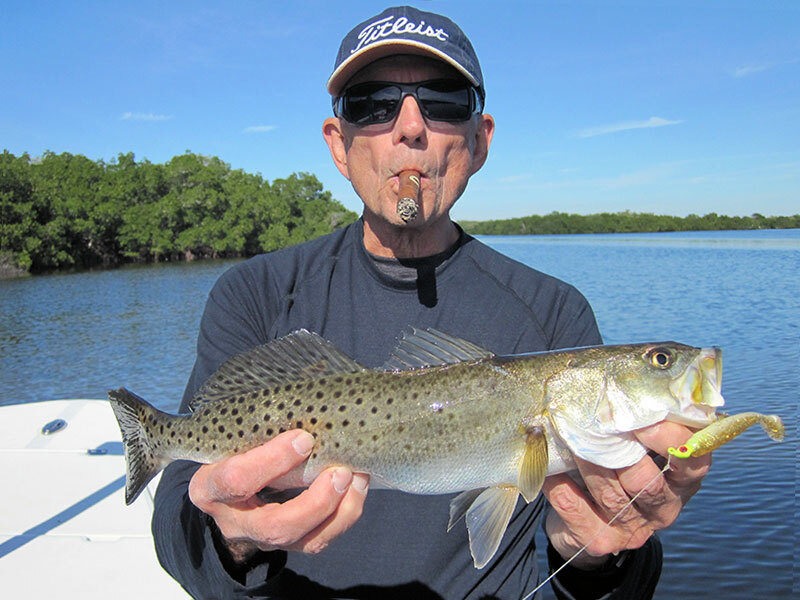 If you like to fish and see some Dolphins at the same time Sarasota Bay is the place to be. 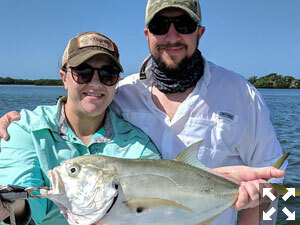 There are plenty of large jack crevalle, trout, and ladyfish in the bays and fun fishing is at a premium. There are a few pompanos here and there if you’re looking for one for dinner. 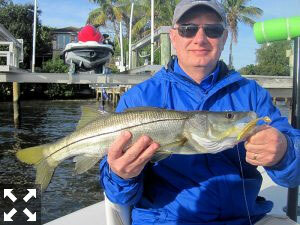 CB's tackle has some inexpensive combo rod and reel setups with line perfect for seawall fishing while you visit. At the end of your stay give it to a kid and make his or her vacation fantastic. Catching this one made for one happy ending. Fishing aboard the "Gone Coastal" with Captain Terry Simmons, out of CB's Saltwater Outfitters on Siesta Key. This week was challenging with cold fronts and a few foggy mornings moving through. 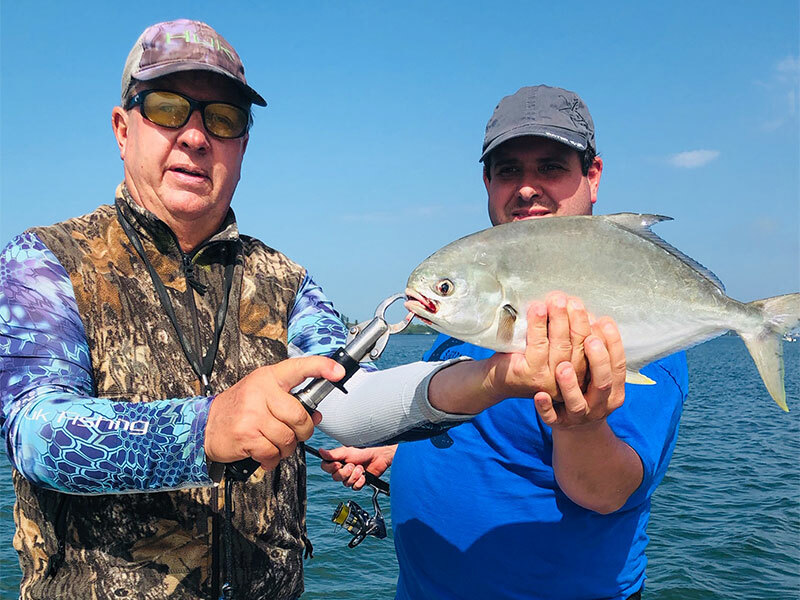 Clients were able to catch several different species including Jack Crevalle, Ladyfish, Mangrove Snapper, Sheepshead, large Atlantic Sail-Cats and some small Grouper. 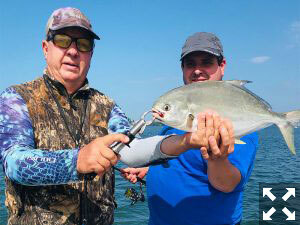 We had a chance for some Pompano but didn't hook up. The fish were chasing the tides moving around looking for food. 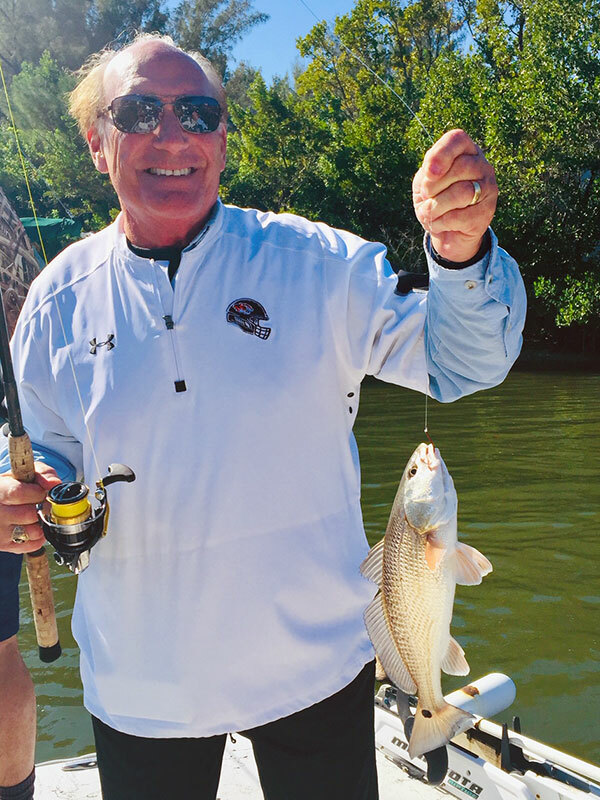 Terry was born and raised in Bradenton, FL and has been guiding clients since 2000, fishing on Sarasota Bay and the Gulf of Mexico with live bait, artificial lures and fly fishing aboard his 22’ Bay Ranger which accommodates up to 4 anglers. 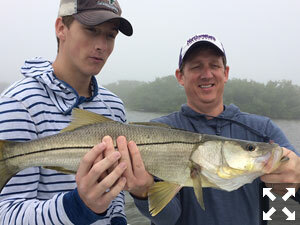 Ken Mackenzie and son Mason, with a nice snook. 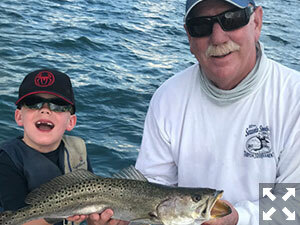 Ken Mackenzie and son Mason, from Chicago, enjoyed a breezy foggy morning fishing with me out of CB’s Outfitters this past week. The conditions were a little challenging but nowhere close to unfishable. 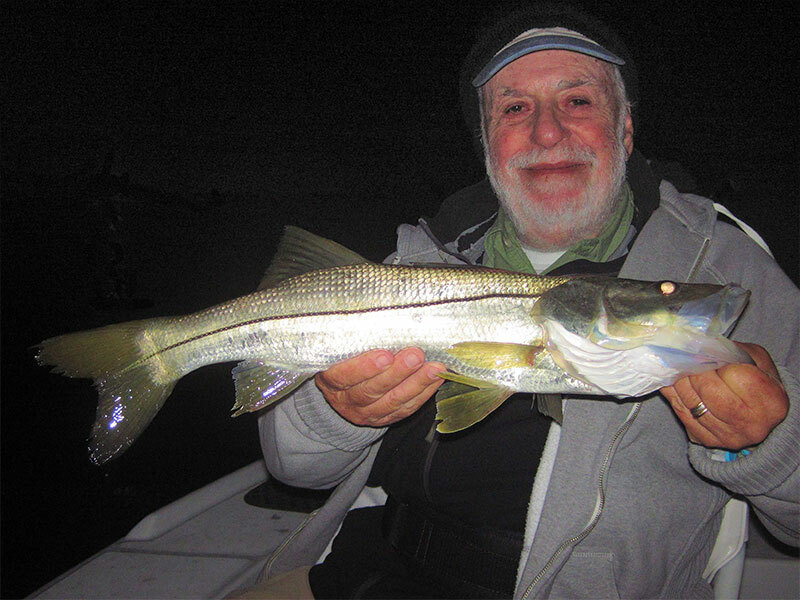 Ken caught a beautiful snook on a white Mister Twister Exude. 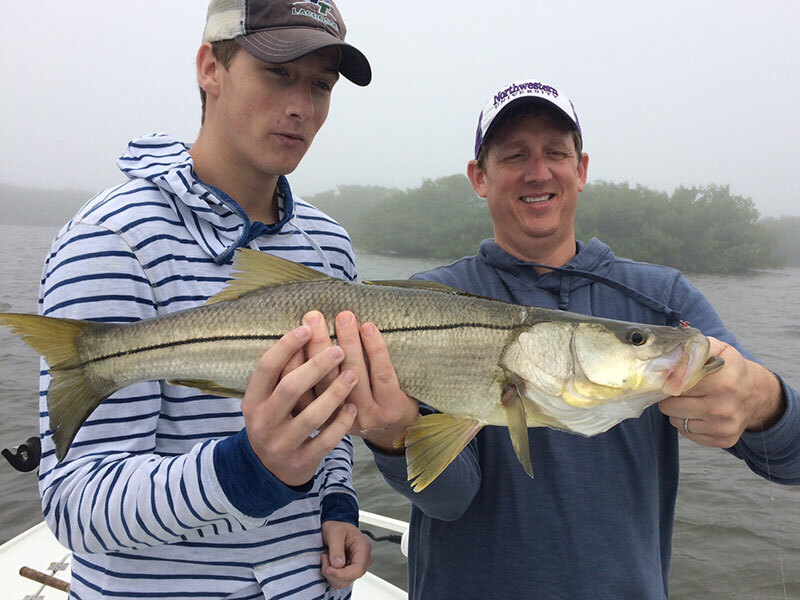 Ken and Mason also caught trout, ladyfish and a few small snook. 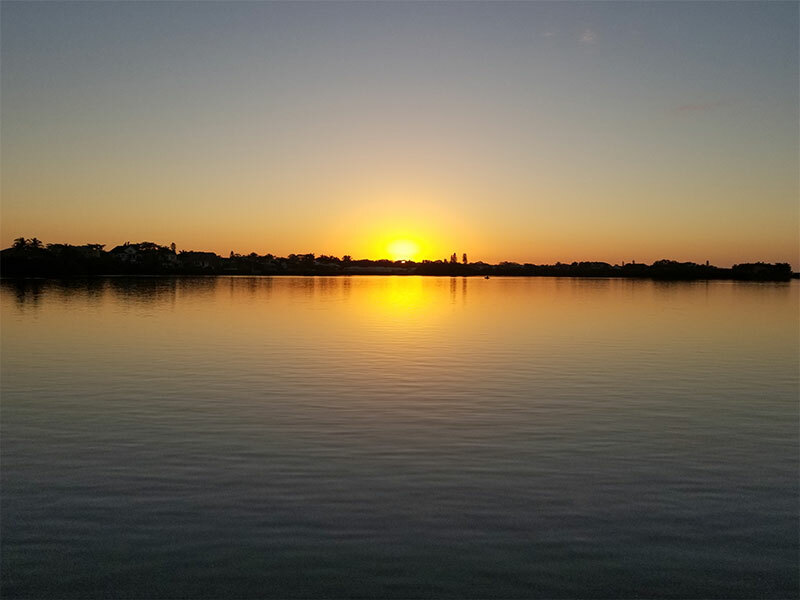 We fished Little Sarasota Bay south of Pointe Crisp. All fish caught were released and a great time was had by all. Happy fishing! 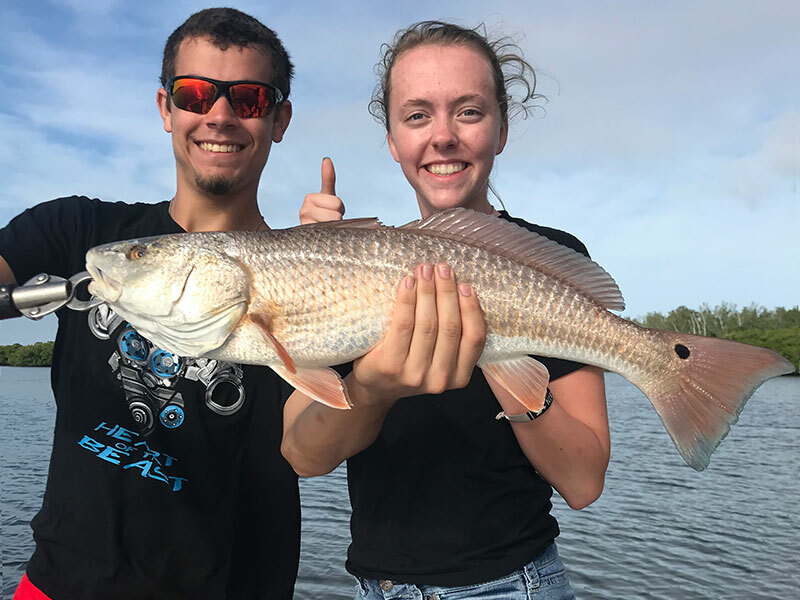 Corbin and his girlfriend Sarah, teased a nice redfish. Corbin, shown here with his girlfriend Sarah, teased a nice redfish for a hook up on a topwater lure. Corbi and Sarah, fishing with Corbin’s dad Shannon, caught and released several nice fish on what proved to be one beautiful day out on the water. The trio from Indiana was down with the family staying on Siesta Key for the holidays. Besides the redfish, they caught trout, snook, and a jack that almost pulled Sarah into the water. All in all a great way to start the new year! Harriett King with a nice redfish she landed. Happy New Year to everyone, I Hope you had a great 2018 and that 2019 will be even better. Fishing this week has produced snook, pompano, redfish, jack crevalle, black drum, ladyfish, sheepshead, and mangrove snapper. The bite has been a bit sporadic. 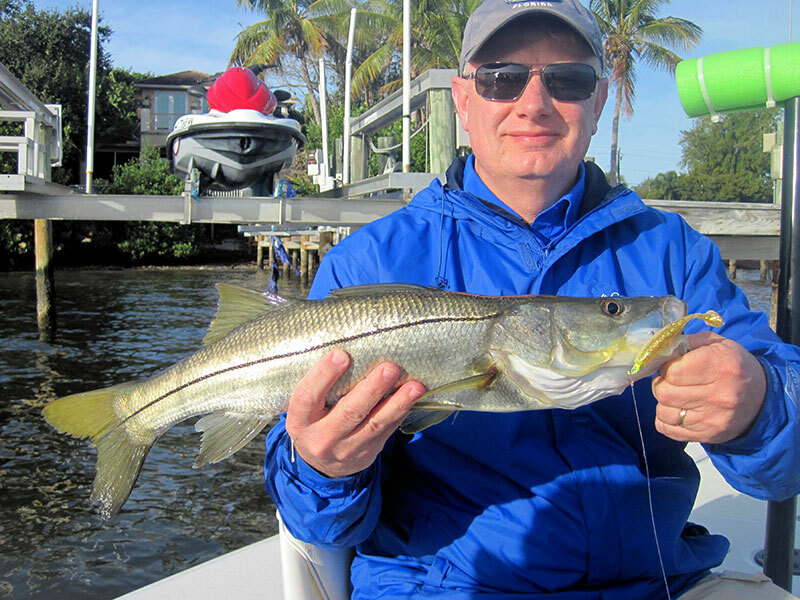 The fish were caught on live shrimp and bucktail jigs working canals and docks. 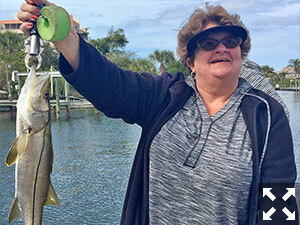 Catch of the week honors go to Harriett King with a beautiful five spotted, 26-inch redfish. Remember, the best time to go fishing is when you can and be sure to save some for seed!